With the upcoming Olympics less than 65 days away, major brands are looking for ways to reach fans that will tune into the games. Last Thursday, Twitter Canada hosted an event for marketers with an emphasis on engaging Twitter users throughout the Rio de Janeiro games. Michelle Slater, head of marketing at Twitter Canada, described the platform as a “virtual campfire” in which fans can go to share a communal experience. She also noted that this will be the first time since Vancouver that North Americans will be in a similar time zone as the Olympic games. Since Canadian fans will be able to watch live, she predicts that many of them will be engaging on Twitter while they watch their favorite athletes compete. Slater advises brands to “be prepared to go beyond sport and engage with what else is happening at the games.” She pointed out that in previous Olympics, some of the highest online engagement points have been during the opening and closing ceremonies. Slater also presented numerous statistics illustrating how the platform enhances fans’ enjoyment: According to Twitter, 91 per cent of those intending to watch the Olympics will do so both online and on TV. Fifty-five per cent said they will use Twitter more than usual during the Olympics. Martheyn was also quick to point out that Twitter is not meant to compete with TV, but rather work in conjunction with it. Branded hashtags are also an excellent way to engage Twitter fans, according to Martheyn. Since users are already going to be tweeting about major events, Twitter believes that brands can capitalize on them by creating hashtags, such as #JustDoIt from Nike and #ShareTheForce from Target. 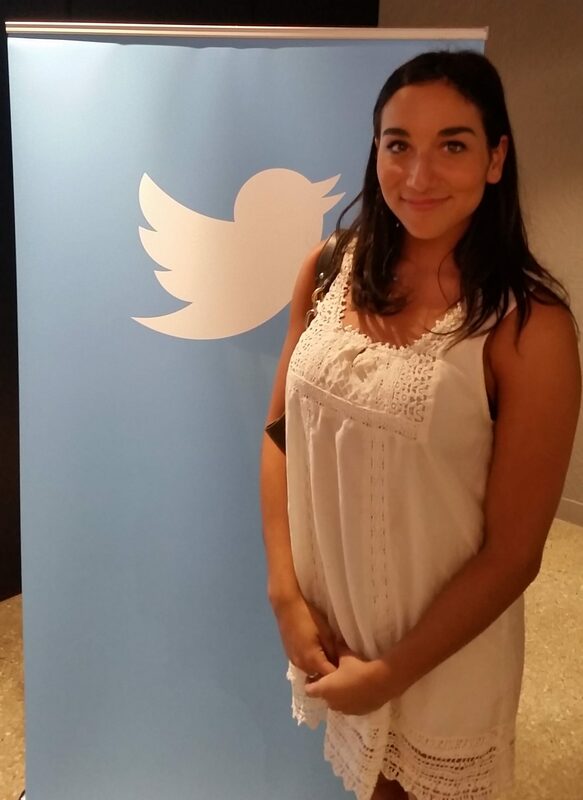 Olympian Alex Orlando pictured at the #TwitterHosts event. Twitter also had an Olympian stop by to discuss her experience with social marketing. Alexandra Orlando is an Olympic rhythmic gymnast who now works in communications for Rogers. She explained that athletes are also marketers, and are always looking to advertise their personal brand. “[Social networks have] had such a dramatic impact on how athletes can speak to their fans, the younger generation and the world,” Orlando says. She believes that marketers should try and build a relationship with athletes before the games to establish a solid campaign, noting that the Olympics are a short period of time in the life of an athlete, and the journey to get there is every bit as inspiring.